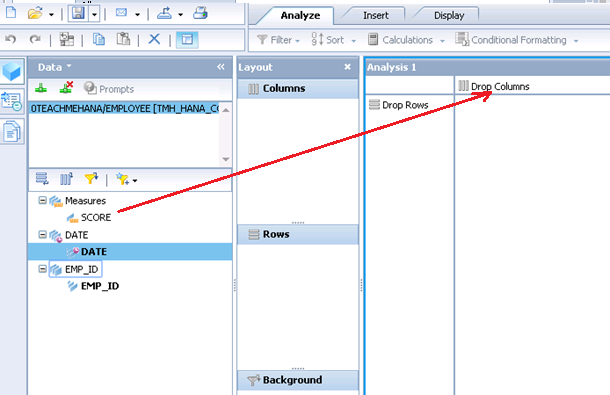 Welcome to part-2 of the SAP Business Objects OLAP Analysis tutorial where we continue from Part-1. If you directly landed on this page, please make sure to read the first part by clicking here. 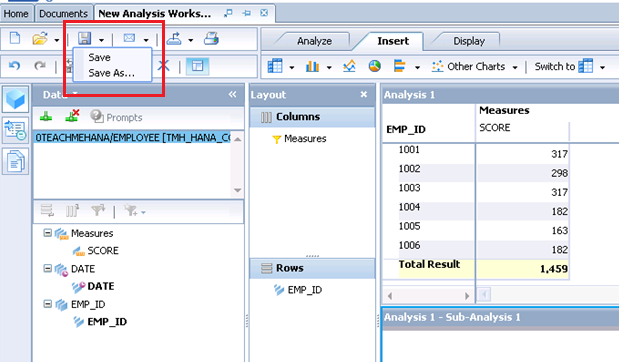 If you followed all the steps in the previous part 1 tutorial, the SAP Business Objects OLAP Analysis application would have now opened up. 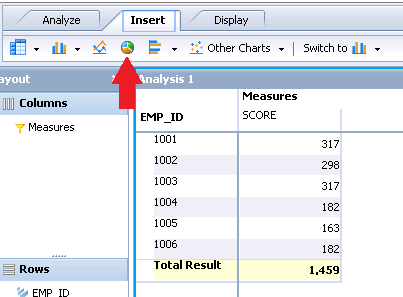 Similar to the excel add on, this web based alternative also requires you to define rows and columns of the report. Also, background filters can be defined but are optional. The screen pretty much tells you what to do. First, we drop the SCORE column to the “Drop Columns” area. We see that there are no rows in this table yet so the scores have aggregated up. Let’s fix this. Drag and drop EMP_ID into rows. 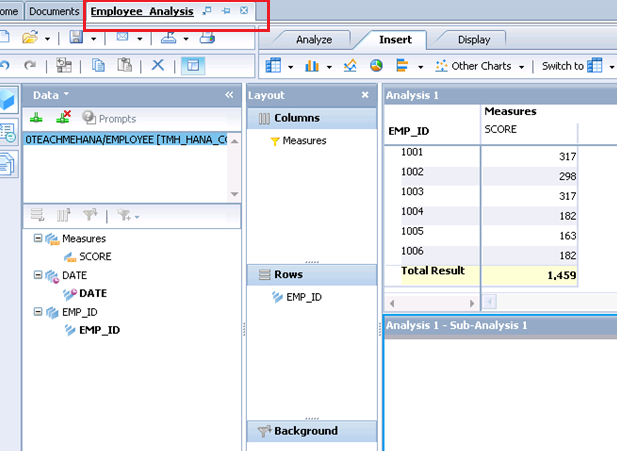 This splits up the data by employee ID and we get a table as seen below. We can have multiple types of analysis in the same report. Let’s go ahead and add a pie chart too. Click on the button that looks like a pie chart to insert one. 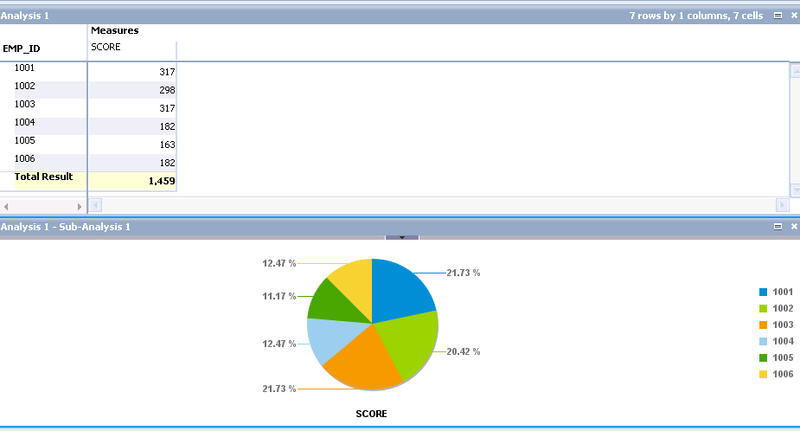 This brings up a pie chart which shows a distribution of overall scores by Employee in a Sub-Analysis. 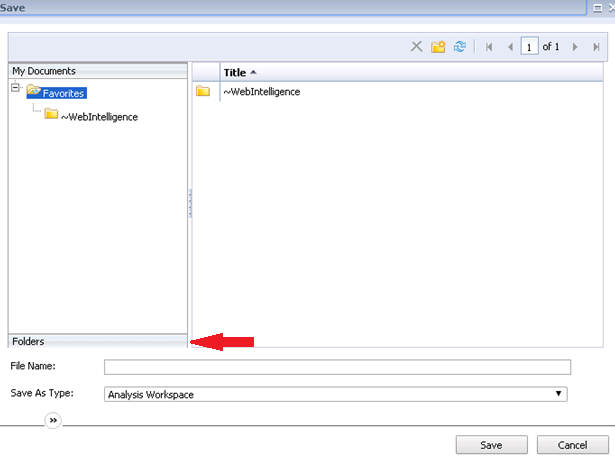 Once a report is created, it’s important to save It into the SAP Business Objects repository so that other users can also access it. To do this, press the “Save” button as shown below. 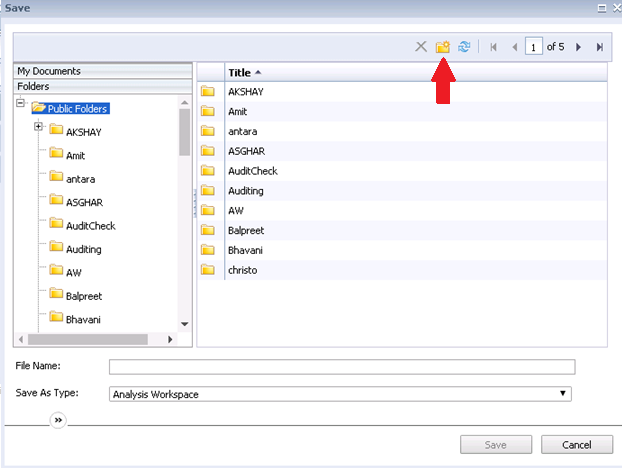 The default folder that opens up is usually the “Favorites” folder but it is recommended that you save these reports in a project folder where the user would come read it from. To view the list of public folder, click on the “Folders” button. Upon clicking the “Folders” button, it brings up the list of “Public Folders”. Save to your existing folder or else, create a new folder here. 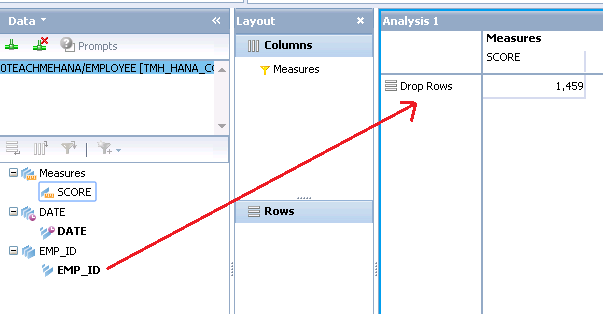 Let’s create a new one which we will also use throughout the course of this section of the “Reporting on HANA” tutorial. Press the Create folder button shown below. It would ask you for a folder name as shown below. I give it the name TEACHMEHANA. Click on this newly created folder and give it a filename. 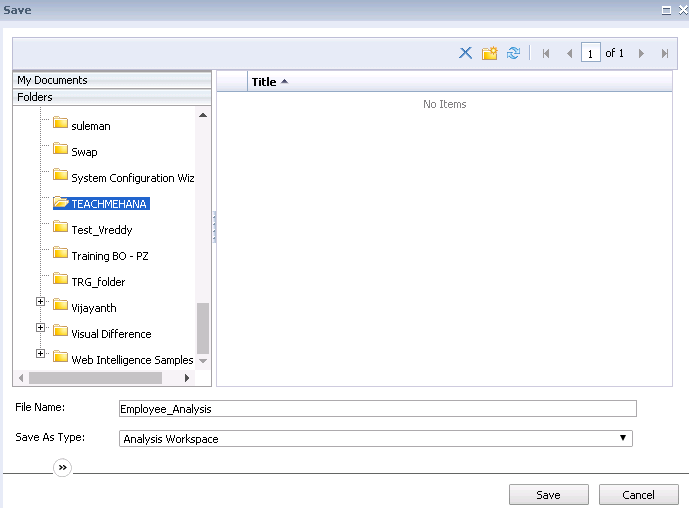 For example, I give it the name Employee_Analysis here. Press Save when done. The file name now reflects on top of the document. This confirms that the document was saved. 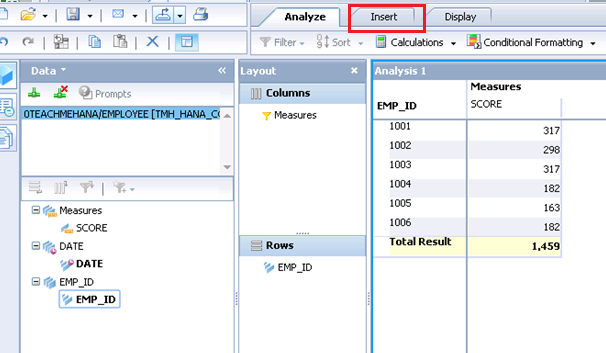 This concludes our SAP Business Objects Analysis for OLAP integration with SAP HANA tutorial. Please share this document across social media if you liked the content to help support this website. Comment and subscribe to keep the community active. Check out our next tutorials to learn more.